Generally, concrete columns consist of square, rectangular or circular cross sectional area. 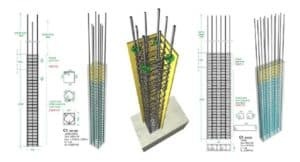 Columns are essentially required with the primary longitudinal reinforcement and lateral ties to avoid buckling of the primary bars. The details of minimum and maximum limits of reinforcements, minimum no. of bars, the size of bars, cover requirements, diameter, and spacing are given in the above picture. 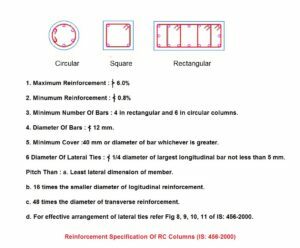 In case of RC columns consisting helical ties, 6 basic longitudinal reinforcement must be given to the helical support. The spacing of the longitudinal reinforcement should not be more than 300 mm. The maximum and minimum values of the pitch of helical reinforcement is restricted to 75 mm and 25 mm. Helically reinforced portions have considerably greater load conveying limit than those have common lateral ties because of higher degree control of concrete in the center. If you liked this article, then please share and subscribe to our newsletter.